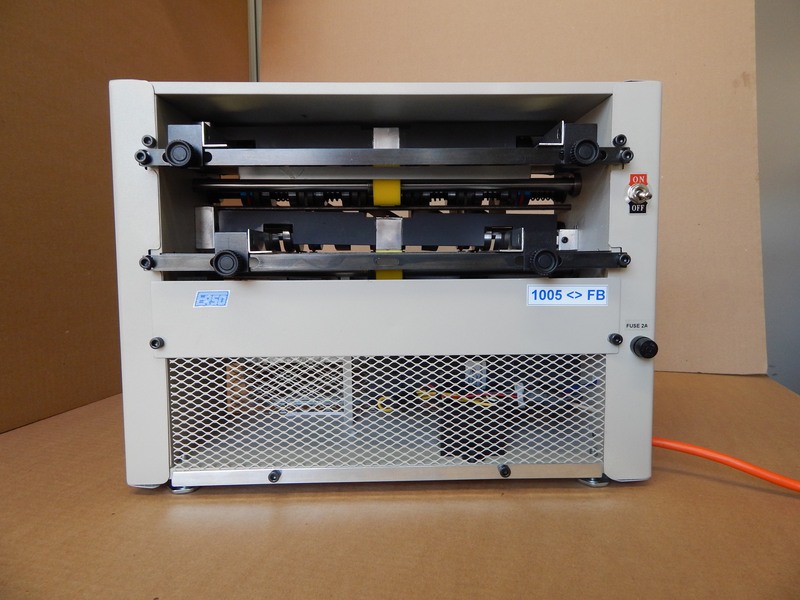 Business Card Slitter, Full Bleed, High Speed, Heavy Duty , Professional, Automatic, Electric 1005FB for stock 8.5″ x 11″. Full Bleed Business Card Slitter is used to cut full color business cards with 1/8″ gutters between each of the cards. The principle of business card cutter operation. Business Card Slitter Full Bleed 1005FB accommodates 8.5” x 11” stock and and creates finished product (10 Full Color Business Cards) in 2 passes. Slitter cuts 8.5” x 11” sheets into two strips of 3.5” x 11 “ on the first pass with gutter 0.125 -1/8″( gap 1/4″-0.25 available) between Business Cards and finished the job by taking the 5 up sheets and cutting them down to 2” x 3.5” cards with gutter 0.125 -1/8″( gap 1/4″-0.25 available) between Business Cards. Infeed stack allows keeping up to 50 pages #150 and cut with speed up to 500! Business Card per minute. 6) Easy cut glossy paper 12-14 pt. 7) Finished product accurately stacks into special boxes. 8)This slitter’s powerful motor allows you to cut hard card stock rapidly and precisely. Business Card slitter. Full Bleed, High Speed, Heavy Duty.